Brought to us by Bulk Powders, Pure Whey Protein™ was awarded Gold in the Men’s Fitness Sports Nutrition Awards 2018 for outstanding quality and value. This is more than encouraging for any customer and it validates the nutrition company’s core philosophies of the best quality for the best prices. Bulk Powders has been trading in good value, high quality sports supplements since 2005. They produce their products and sell direct to the consumer which enables them to sell at lower prices. Whey protein is a valuable supplement and its been used by bodybuilders and athletes longer than any other supplement on the market today. But what makes Bulk Powders Pure Whey Protein™ so great? Collected, as many people know, as a by-product of cheese and yogurt manufacturing, the ‘whey’ is processed to increase its protein content and maintain its amino acid profile. Whey concentrate is the least processed form of whey protein, meaning it costs less but has a lower protein content than whey isolate, for example. Whey concentrate is typically between 35-80% protein by weight. 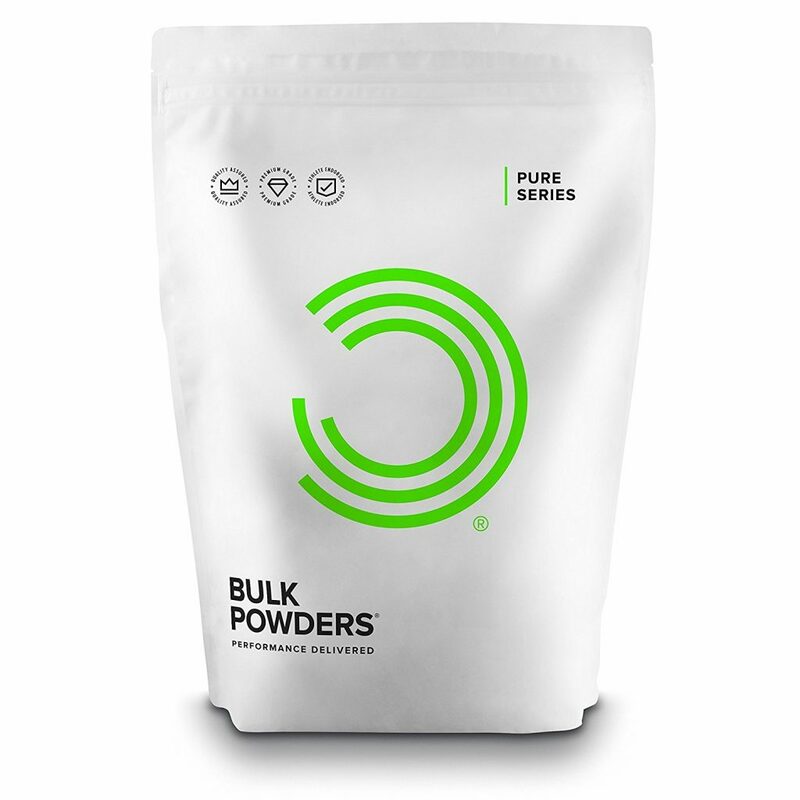 So at 82%, Bulk powders delivers a solid amount of protein, coming in at 24.2g protein per 30g scoop unflavoured, and flavoured protein ranging between 22.5-23.2g per scoop. To put this into perspective, whey isolate, which undergoes different processing steps to whey concentrate, typically achieves 90% protein by weight and is more expensive to produce and for you to buy. The rest of the weight is made up with carbs and fats from the milk it was derived from. 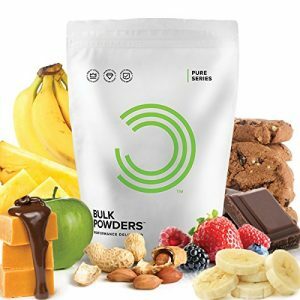 Bulk Powders Pure Whey is low on both fronts. The unflavoured whey contains 1.5g carbs (sugars) and 2g of fats (0.76g saturates) per 30g serving, and their flavoured variations range from 2.3-3g carbs (sugars) and all have 2.5g fats (1.5g saturates) per 30g. Undenatured whey means that the milk proteins have not been broken down during processing. 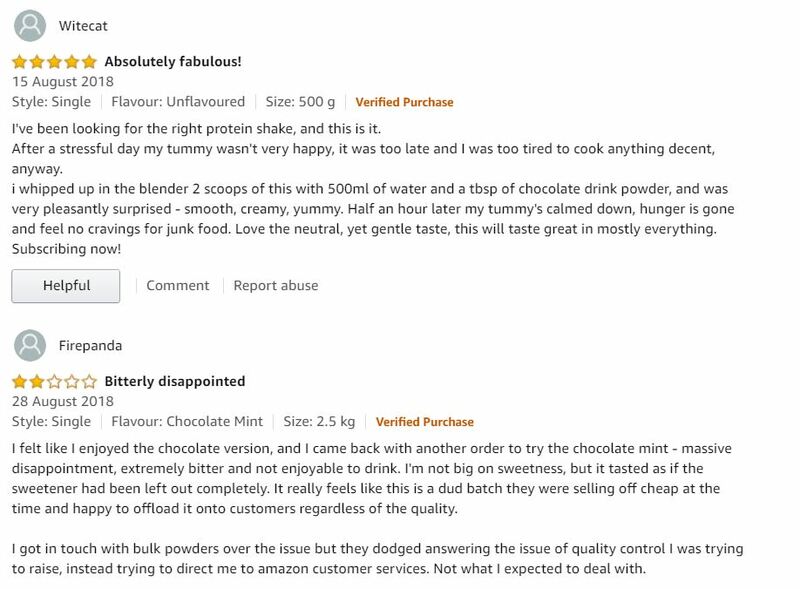 Some whey is bought denatured, (hydrolysed whey). Here, the peptide bonds that hold the molecule together have been breaking down through chemical and enzyme treatments, making it even faster absorbing than undenatured whey isolate and a little easier on the stomach. But don’t get the wrong impression of whey concentrate, it doesn’t exactly hang about after ingestion; it’s considered a light, bioavailable and fast absorbing form of protein. Bulk Powders unfortunately doesn’t give us an amino acid breakdown, which normally wouldn’t bother me. In this case it goes the extra mile to say its Pure Whey Protein has a high glutamine content, but doesn’t list its dose. I’m nit-picking. Whey is a complete source of protein, meaning it contains the nine essential amino acids that your body needs but it cannot produce. Pure Whey Protein also contains BCAAs (branched chain amino acids) that are non-essential, but highly beneficial for building muscle. Our old, reliable friends, leucine, isoleucine, and valine. Leucine is our core BCAA, it signals for muscle protein synthesis. I only wish the amino acid breakdown was included. In one 30g serving, Bulk Powders Pure Whey Protein contains 5.3g of BCAAs (taken from the protein weight content of course). So if you’re having two scoops, that’s a decent amount of BCAAs to kick start protein syntheses, but you might do well sipping some BCAAs pre or intra-workout as well. Soya lecithin is a common instantising (mixing) agent used in powdered supplements like whey protein. It’s an ingredient that has an important role in the consumers experience of the product. High protein content powders do not behave well with water; the powdered protein is hydrophilic (attracts water) and when wet, causes a gelatinous, lumpy mess. Instantising agents like soya lecithin get in the way of the protein particles, allowing water to disperse evenly. 650 times sweeter than table sugar and calorie free… it’s not surprising that sucralose is a common sweetener in low calorie supplements. Derived from sucrose (run of the mill sugar) it is so sweet it’s often mixed with other calorific sweeteners to dilute its potent taste. The body does not recognise sucralose as a sugar, hence the calorie-free label, and only absorbs between 11% and 27% into the bloodstream. The rest is excreted as waste. Sucralose has been linked with migraine headaches, but more research is needed to explore and confirm this. Acceptable daily intake of sucralose is 15mg per kg bodyweight. The content of sucralose is unfortunately not listed in Bulk Powders Pure Whey Protein™ but it will be in very small amounts. Bulk Powders is a respected and trusted name in the UK supplement industry and has been trading since 2005. Its best-seller Pure Whey Protein™ was awarded Gold in the Men's Fitness Sports Nutrition Awards 2018 for outstanding quality and value. Bulk Powders Pure Whey Protein™ has a high protein content by weight for whey concentrate — starting at 24.2g per serving. Includes 5.3g amino acid per serving. Market leading value. Low price and high quality. starting at £16.99 a kilo. 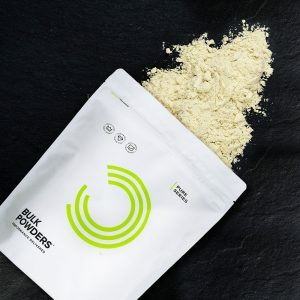 Bulk Powders is a reputable brand. 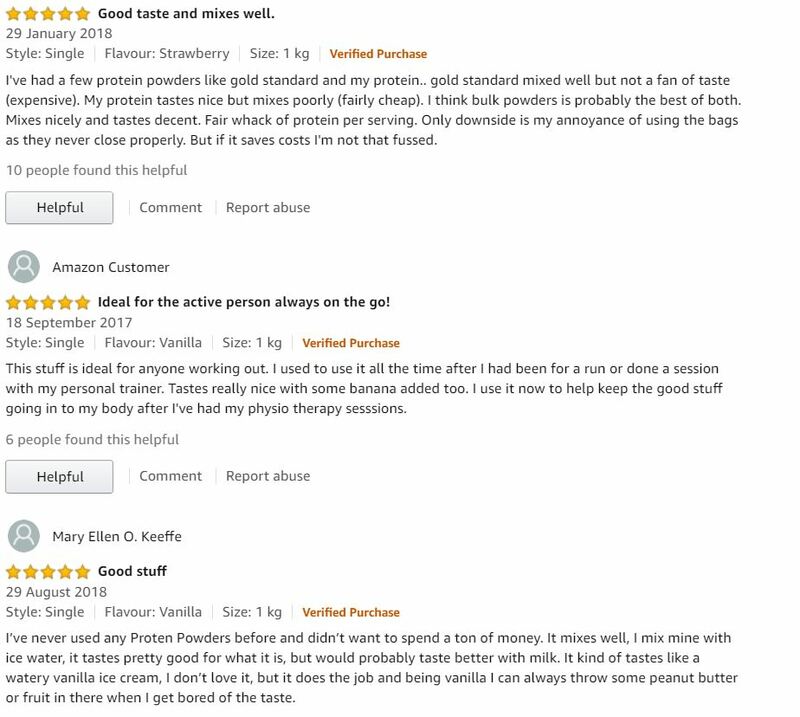 Amazing reviews — over 2,200 reviews between amazon and Bulkpowders.com, over 1800 of which are five stars. Protein content drops with the addition of flavours. But this is expected. As with most whey protein shakes, especially whey concentrate, they can sometimes cause some indigestion or bloating. If you find this, maybe have a look at switching to a whey isolate or hydrolysed whey protein that’s easier to digest. If you’re allergic to soya, consult a physician before taking Bulk Powders Pure Whey Protein. Although the soya lecithin is in a tiny amount, in can contain soy allergens. Obviously, this product is not suitable for those with any milk allergies. Each one scoop should be mixed with 200ml of water in a shaker bottle. Take 1-5 servings per day. Bulk Powders recommends consuming 2g of protein per kg of bodyweight to build muscle. Obviously, this will be dependant on your training goals. Bulk Powders Pure Whey Protein is for anyone looking to supplement their protein intake. Whether it’s to build muscle or strength, as part of a weight loss or cutting period, Pure Whey Protein by Bulk Powders is a flexible product. If you’re looking for a great value whey protein supplement you can’t really put a foot wrong by giving Bulk Powders Pure Whey Protein a shot. The odds are stacked in this proteins favour. It is award winning for value and quality, high protein, low carb and fat content, and decent serving of BCAAs. It sits at the core of Bulk Powders’ extensive range and its reassuring to buy from a trusted, well tested manufacturer. The only thing I can say that’s negative about this product is what is missing. There’s no amino acid breakdown. This is common practice with cheaper end protein powder, but I find it odd when Bulk Powders pushes the glutamine content online… of which there is no specified trace of on the ingredients list. If I’m being picky, I’d also love to see whey isolate used as part of a protein blend. But to be fair, the whey concentrate here is high quality. For me, the main takeaway is, you get what you paid for and more. It’s a quality whey concentrate product for the small dent it’ll make in your wallet/ purse. At the price, it’s hard to complain… more than 2,200 people most definitely aren’t.